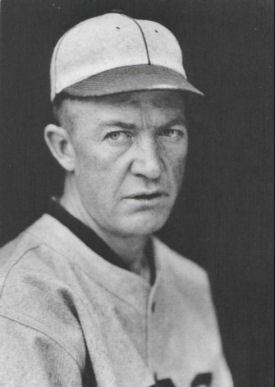 Excerpts of the Following were taken from "Total Baseball"
When Grover Cleveland Alexander retired in 1930, he saw his name at the top of the "Games Won" column in the National league record book. A recount eventually added one more win to Christy Mathewson's lifetime total to leave them tied at 373. That was kind of fitting because one or the other was certainly the best NL right-hander of the first half of the 20th Century. 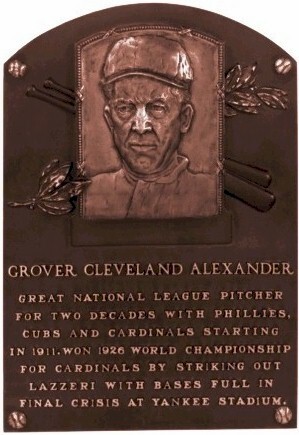 Alexander went into the Hall of Fame in 1938, two years after Mathewson. Military service in World War I cost Alex one-plus years after three straight 30-win seasons, and a shell that burst in his ear may have triggered the epilepsy and led to the alcoholism that plagued him for the rest of his days. A gas attack in a training drill eventually cost Mathewson his life. Matty's out pitch was his fadeaway; Alex had a good fastball and better curve, all delivered with an easy, just-tossin' motion. Both had the kind of control that could carve a roast. Alex won two of the three games in which they faced each other. 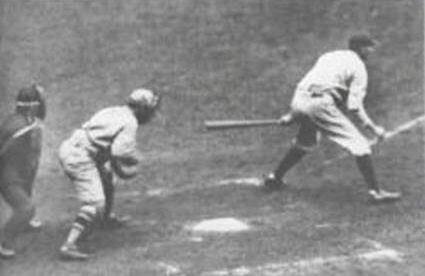 Not even Mathewson ever had a moment like Alexander's in the 1926 World Series. The grizzled veteran, nearing 40 won his second Series game for the Cardinals in Game 6. What happened after the game was later reported by Amie Alexander and counters many claims which indicated Grover celebrated with more than sarsaparilla. Amie's account states that manager Hornsby approached Alex after the game and suggested that he might be needed the next day and asked the ole vertran to take it easy that night, which Amie said he did in anticipation of one final series victory. The next day Pete was summoned to the mound in the seventh inning of the final game. Cards led, 3-2 but the Yankees had slugger Tony Lazzeri. After two more shout innings, the Cards were champs and Alexander was a legend. The incident served as the climax of the movie "The Winning Team," with Ronald Reagan portraying Alexander. (Left is Lazzeri's Strike-out) The Lazzeri strikeout crowned a career that glittered with three 30-win seasons and six 20-win seasons. His 90 career shutouts are second only to Walter Johnson's 110. His Lifetime ERA of 2.56 included seasons of 1.22, 1.55, 1.72 and 1.73. Alexander's 227 strikeouts in 1911 set the rookie record; Dwight Gooden broke it in 1984. But his 28 wins still stand as the freshman mark; four were consecutive shutouts. In 1915 he led the Phillies to a pennant, winning 31 and clinching the flag with a on-hitter. He won one more in the World Series against Boston-- the last Series win for the Phillies until 1980. Al this was doubly impressive because he pitched his home games from 1911 to 1917 in little Baker Bowl, with a right field wall just off the second baseman's hip, and, from 1918 to 1925, at hitter-friendly Wrigley Field. In 1916 Alexander tied a 40-year old mark with 16 shutouts and nine of these were registered at Baker Bowl. Grover retired to St. Paul, the town he called home. In August of 1950, battling cancer and other ailments, Grover showed local St. Paul youth the art of pitching. In November after having attended the World Series died in a boarding house at 617 6th Street, St. Paul of heart failure. Alexander a veteran of the first World War, was buried with full Military Honors. His grave is clearly market north of Veteran's Circle at the Elmwood Cemetery, south of St. Paul. Click here for books about Alexander.